Looking back at railways of bygone days, many people view the subject with rose tinted spectacles and a high degree of nostalgia. To those who ran those same railways the matter however was one of hard nosed business. Much of the history of the railways revolves around the business of finance, mergers, acquisitions and so forth. During the mid 19th Century a new business began to grow rapidly across the nation. This was the business of transportation. As the country became increasingly industrialised and the economy grew there was a growing demand for the movement of people and goods. This was in part driven by and also itself drove the boom of the railway industry in the British Isles. New companies sprang up across the land; the northern province of Ulster in Ireland was no exception. Railways represented an exciting new venture to many businessmen. They represented prestige to landowners whose property carried the rail and stations. Finally they represented opportunity to merchants and businessmen whose towns were served with passenger and freight services. 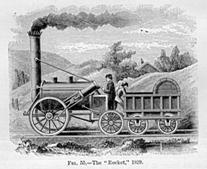 The Belfast and County Down Railway Company operated a system, which at its peak covered 80 miles, exclusively within County Down between 1848 and 1948. The Belfast and County Down Railway Company was formed on the 25th February 1845 by a number of local businessmen. Originally their intention was to open a railway serving Holywood, Comber and Newtownards. This was later extended to include the ancient market and ecclesiastical town of Downpatrick. The company received its licence by Act of Parliament in 1846. Two years later the line to Holywood was opened on 2nd August 1848. Reports of the time enthused that this was a most comfortable and elegant means of transportation and initial receipts were promising. Construction soon began on the mainline to Comber. This was completed in late 1849 and the line was then extended to Newtownards. Opening day was 6th May 1850 and was a gala occasion attracting large crowds. 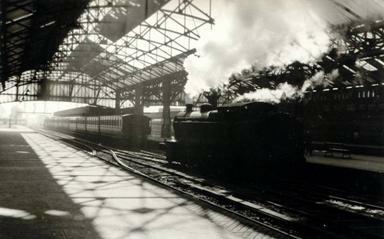 Although the station building at Dundonald was only partially completed, the first trains made brief stops there as they made their way back and forth down the single track between Belfast to Newtownards. The permission obtained in the original 1846 Act of Parliament for the rest of the route to Downpatrick lapsed and in 1855 a new Act was obtained. The original route plan was altered to include the villages of Ballygowan, Saintfield and Crossgar. The route passed through some difficult terrain and required many rock cuttings. The most notable one between Comber and Ballygowan was known as “the gullet”. The line to the Ballynahinch via Ballynahinch Junction was opened in 10th September 1858. The mainline to Downpatrick was opened 23rd March 1859. Although enough land was purchased between Comber and Downpatrick to allow double track to be laid this entire section remained single track throughout its life. In 1865 a new company, the Belfast, Holywood and Bangor Railway company, opened a line between Holywood and Bangor. In a period of financial difficulties the BCDR sold its Belfast to Holywood branch to the BHBR. 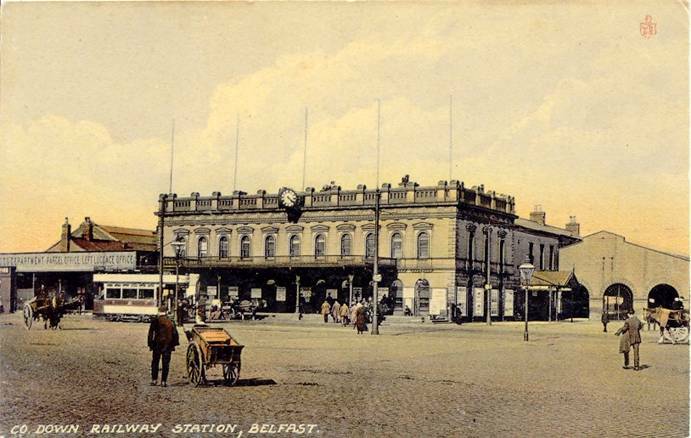 This gave the BHBR access to Belfast city where it built a separate station adjoining the BCDR terminus. Over time the BHBR began to run into financial difficulties. In 1874 they leased their Bangor line to the BCDR. By 1884 the situation was irretrievable and the BHBR was finally wound up by Act of Parliament. Its assets were transferred to the BCDR and the adjacent stations at Queen’s Quay were merged. 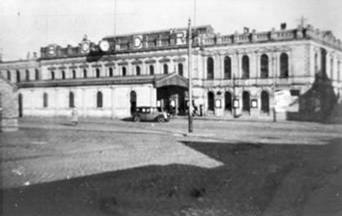 The photograph shows this station sometime in the 1930s. Meanwhile the line from Newtownards was extended to Donaghadee, and was opened on the 3rd June 1861. Donaghadee was seen as a key location as hopes were high that an important sea link between Donaghadee and Portpatrick in Scotland would develop and bring traffic into the system. A new harbour was completed in Donaghadee in 1863. However concerns about the safety of Portpatrick harbour saw the rival Larne - Stranraer link becoming the preferred route to Scotland. The directors of the BCDR were keen to extend the line beyond Downpatrick. However, in 1861, a new company, the Downpatrick & Newry Railway Company obtained an Act of Parliament to build a railway linking the BCDR line at Downpatrick with the Newry, Warrenpoint & Rostrevor Railway. These plans did not come to fruition. It was not until 1866 that an alternative Act, the Downpatrick, Dundrum & Newcastle Railway Act, was passed. This Act was modified in 1868, allowing the BCDR to invest in the company, effectively making it a parent company to the DDNR. For 12 years the line was worked by the BCDR, at which point it was purchased outright. Newcastle was important because of the potential tourist trade. The scenic mountains of Mourne, the sea-side location and beaches offered an attractive package. The BCDR actively sought to encourage this market by assisting in the formation of a golf club, the Royal County Down, near its station. In 1898 the company opened the impressive 5 storey Slieve Donard Hotel with 120 rooms, again close to the station. The Downpatrick, Killough & Ardglass Railway was incorporated into the BCDR in 1890. At this time an Act was obtained under the Light Railways (Ireland) Act, though in reality the line did not differ much from the rest of the BCDR system. This branch was partly funded by government grants to aid the herring fishing industry at the harbours of Killough and Ardglass and was opened in 1892. The much larger Great Northern Railway (Ireland) company had a branch line through Banbridge to Ballyroney some 18 miles from Newcastle. The growth of the tourist trade to Newcastle made it an attractive target for the GNR(I) to reach and they sought to extend their line through Castlewellan to Newcastle. The BCDR argued vigorously against such a move fearing it would mean a reduction in traffic over their network. In the end an agreement was reached whereby the companies would each extend their networks to meet at Castlewellan. This would be a joint station and the GNR(I) would have running powers to Newcastle. In return the BCDR got running powers to Ballyroney. This was a small hamlet and as such these powers had dubious value and were never exercised. The 24th March 1906 saw the arrival of the first GNR(I) trains in Newcastle. The line between Ballymacarrett and Knock was doubled from 1877 onwards. As traffic increased two further sections of line were doubled. This work began around 1892 on the mainline from Knock to Comber and also the line to Bangor. The latter was done in stages and completed in 1902. The rest of the network remained single track throughout its lifetime. The following map shows the final form of the BCDR network. The route covered approximately 80 miles, all within County Down. During its lifetime from 1848 – 1948 the line had some 51 stations though some closed after reasonably short periods of use. It is worth noting that the BCDR not only ran a rail service. Between 1893 and 1915 they ran a passenger steamer service on Belfast Lough. The journey ran between a jetty on Donegall Quay and Bangor. This service became affectionately became known as the ‘Bangor Boat’. The company also branched out into road freight services on the Ards peninsula between Newtownards and Portaferry and also between Newcastle and Ardglass. BCDR passenger buses also ran services across the county sometimes in direct competition to the railway! The period after the start of the 20th Century was really the heyday of the BCDR system. In 1914 company dividends peaked at 6½%. War broke out in August that year. Passenger receipts increased especially with traffic to the army base at Ballykinlar which had an unadvertised halt for a period from 1915. After the war there followed a period of unregulated competition from bus operators. At one particular time there were no less than 27 private bus services operating within County Down alone! This competition was especially felt in towns where the railway journey was longer than the equivalent road journey to Belfast. In areas close to Belfast the tram also was a major competitor. The extension of the tram line to Knock in 1905 led to cut throat competition for the commuter ticket. 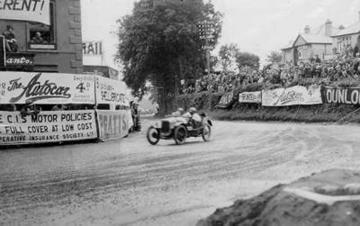 The RAC’s Tourist Trophy was the prize for a series of road races first and was competed for on the Isle of Man between 1905 and 1922. It was later revived from 1928 to 1936 with a new 13½ mile circuit in County Down. The course was roughly triangular and linked Dundonald, Newtownards and Comber. The start was at Quarry Corner and the route raced clockwise. The BCDR main line crossed the route 4 times. Firstly at the site of the first Newtownards station. Next at ‘Glass Moss’ level crossing, (1½ miles from Comber towards Newtownards). Thirdly under the bridge at Comber station and then lastly under the iron trellis bridge at Dundonald station. The photograph shows the hairpin bend at the Central Bar in Dundonald. This event proved to be a great tourist attraction and many people travelled by train to watch the practise sessions and the races themselves. The BCDR took advantage of the situation by offering cheap fares and even building a semi-permanent grandstand at Comber. Glass Moss itself was not a normal halt but became so during the races. The trains could not cross the road and operated to here from either side. The races ended in 1936 after a terrible accident in Newtownards when 8 spectators were killed on the footpath near the Strangford Inn Hotel by an out of control car. Before the war, competition from road passenger and freight services was stiff and the railway was beginning to show the signs of declining profits. During the Second World War the BCDR saw a considerable increase in traffic. This was mainly due to traffic arising from evacuees from Belfast who were living outside the city and also troop movements. On a foggy morning on the 10th January 1945 there was a fatal accident at Ballymacarrett in East Belfast. A railmotor train from Holywood collided with the 7:10 am train from Bangor which was stopped awaiting a signal change. 22 people were killed and a further 24 people injured. The enquiry into the accident placed the blame on the driver of the railmotor for travelling too fast for the poor visibility and also on the company’s rules relating to the passing of signals at ‘danger’. The company paid out a sum of £80,000 in compensation. This was a figure the company could ill afford and it wiped out its Contingencies Reserve. This coupled with declining post-war traffic was one of the factors that led to the transfer of the company to public ownership. In 1946 the Government made public a plan to bring together several of the large independent transport companies under public management by one body. The companies included the Northern Ireland Road Transport Board (NIRTB), the BCDR, the LMSR(NCC) and the GNR(I). These proposals were implemented in 1948 with the formation of the Ulster Transport Authority. At take over the UTA inherited 181 BCDR passenger carriages, 9 passenger brakes, 4 bread vans, 2 carriage trucks and 10 horseboxes. The BCDR wagon stock amounted to 629 revenue earning vehicles. Engineering stock to 23 ballast wagons and 9 rail wagons. Locomotive stock was made up of 1 diesel locomotive and the reminder steam locomotives, 5 of which were tender engines and the remaining 25 engines tanks, mostly Atlantics. The UTA ran the County Down service pretty much unchanged for 15½ months. On 15th January 1950, the mainline south of Comber, the branch lines to Ballynahinch and Ardglass were all closed to traffic. The 22nd April later that same year saw the closure of the mainline between Ballymacarrett Junction and Comber, along with the branch line to Donaghadee. An Abandonment of Railways Order was passed on the 8th July 1953. Shortly after the tracks began to be lifted and station buildings demolished. The Newcastle to Castlewellan branch remained open until the GNR(I) line that linked to it closed on 2nd May 1955. Of the former BCDR system only the Bangor line survived. This is still operated today as part of Translink’s Northern Ireland Railways service. 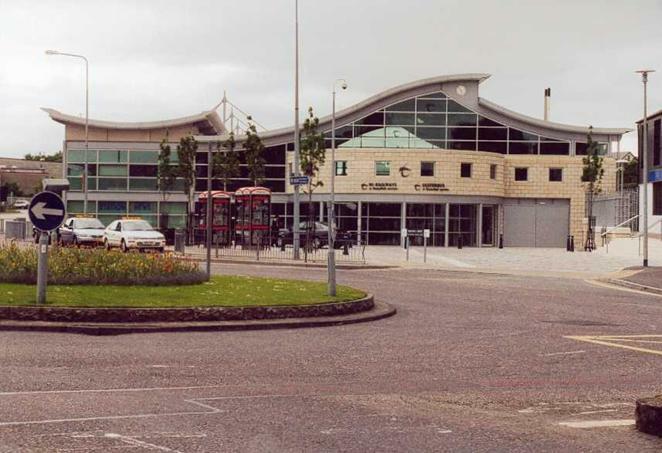 The photograph below shows the new integrated bus and rail station at Bangor.